A new little ice age is looming! Ten days in new all time record for ice in the Antartics! A Limerick. – Len Bilén's blog, a blog about faith, politics and the environment. A new little ice age is looming! Ten days in new all time record for ice in the Antartics! A Limerick. NSIDC.org is back in business after the partial government shutdown and published its daily satellite data for ice in the southern hemisphere. Ten days record ice set down under. In 2012 NOAA’s South Hemisphere Sea Ice Extent set a new all time record with 11 of the 12 highest levels ever recorded. 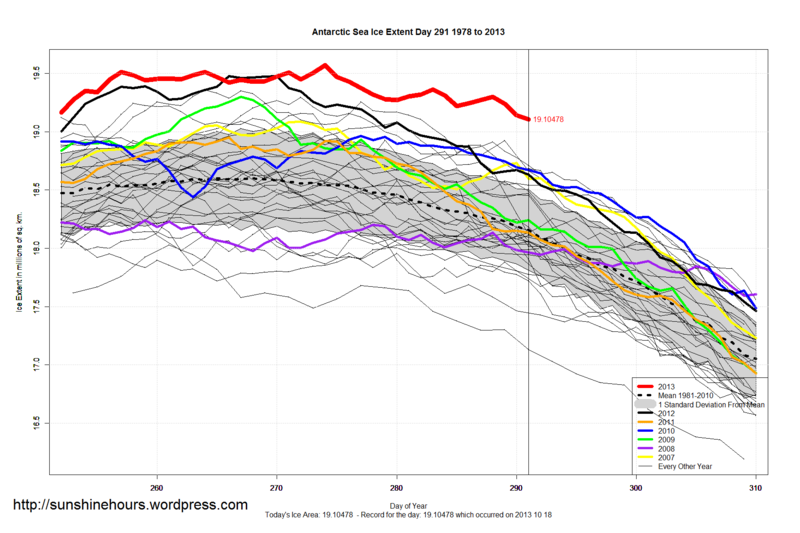 These are the top 12 highest Antarctic Sea Ice Extent’s of all time (in the satellite record)! 11 of the top 12 extents are now in 2013! Next Next post: What’s with those fake faintings for Obama? A Limerick.